If you followed my blog at all last year, you would know I could not shut up about this unicorn clutch - but can you blame me? It's adorable. And finally, at Christmas I got one. I'll admit it's a big statement, and you can't actually fit much in it - really only your phone and some money - but it just brings an element of fun to any outfit you wear with it that it doesn't really matter. It's not available any more, but take a look at The Whitepepper if you love it. Yeah, these are both the exact same jumper in different colours. I bought the first one (mint) two years ago then caved and bought the pink one too. I love the mermaid style pattern they have, and also that they aren't made of wool. I find that because I have very sensitive skin, I can't wear wool and it's so hard to find jumpers that aren't itchy - so these two were perfect for me. 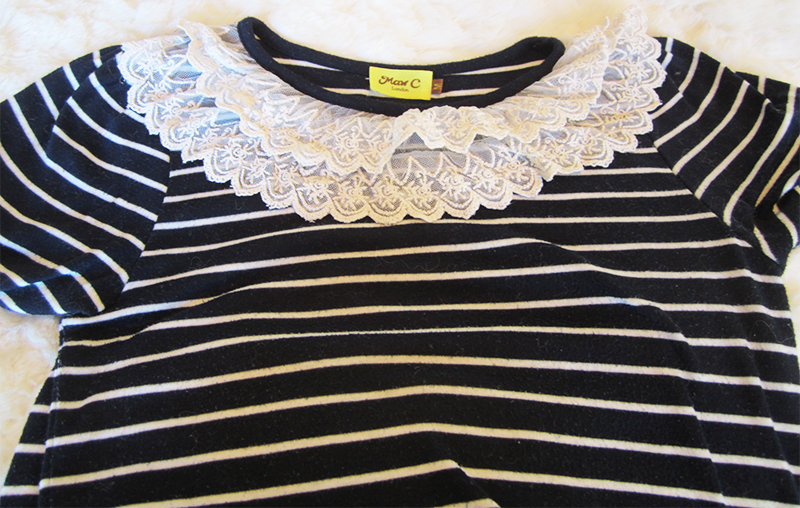 This top is super old, I've had it for years but I love the mixture of the classic stripe with this beautiful lace collar. It's from a brand called Max C but I actually bought it from this amazing boutique store that no longer exists *sad face*. As you can probably tell from my clothes, I don't like showing too much skin. I'm not really sure why that is, but I've never really liked low neck lines. 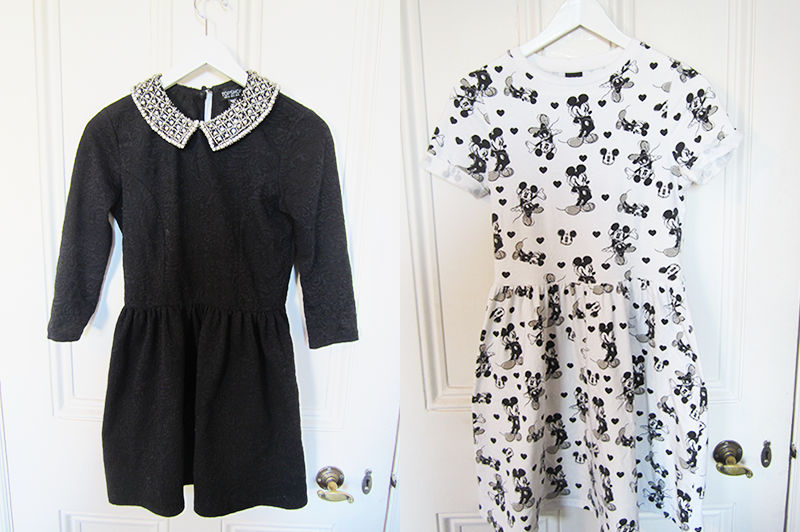 The dress on the left (from Topshop) is one of my all time favourite dresses because it has this lovely brocade fabric, and this pretty embellished collar. The dress on the right is one of my most recent purchases (from Asos) but I love that it's so fun, and has a really cute flirty skirt. I wore this the last time I saw my cousin's son and daughter, and it was so adorable when they saw it was Mickey Mouse, as it brought a big smile to their faces. 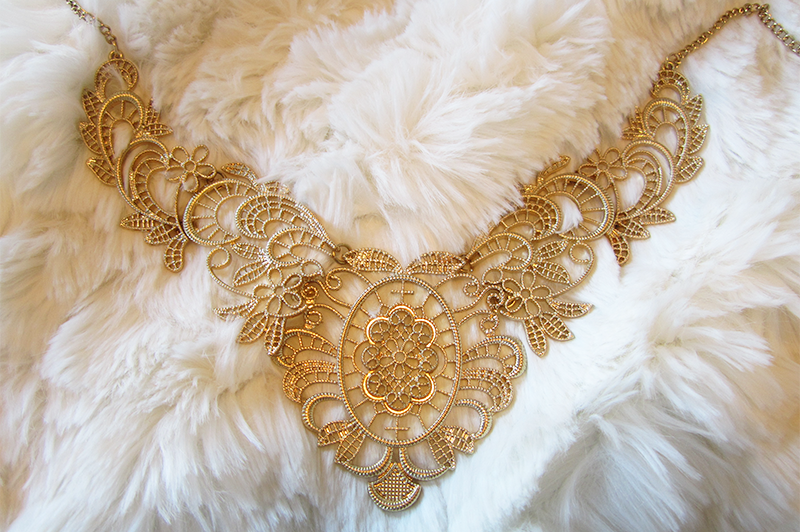 When it comes to Jewellery I tend to go for bold statement necklaces, and I love how pretty and intricate this lace-style necklace is. I got this one in my stocking at Christmas, and it comes from Miss Selfridge. 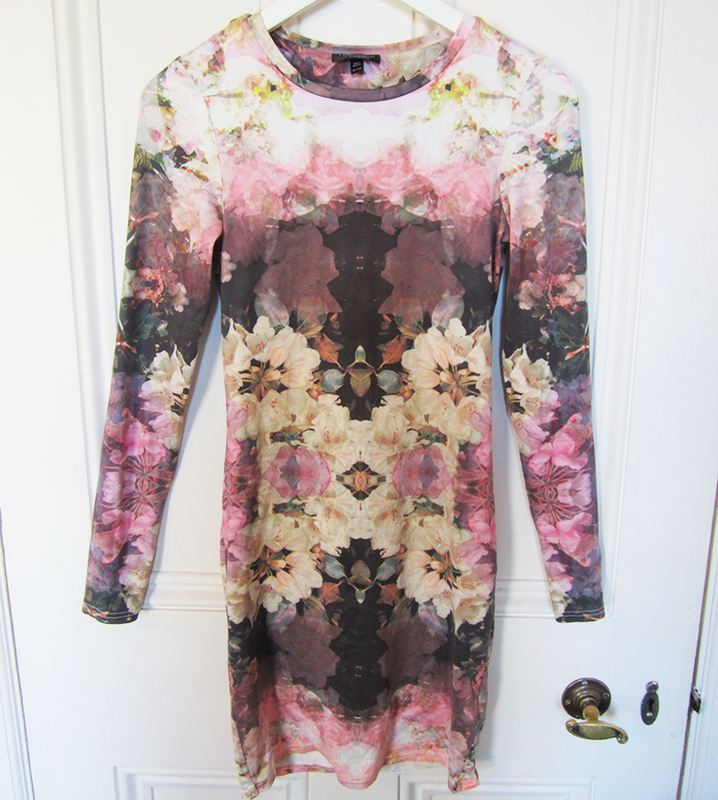 This is one of the boldest dresses I own, being both body con and a really strong print. I love how it reminds me a lot of Alexander McQueen's Plato's Atlantis Collection. It's from Topshop (like most things I own) and is made out of this really love thin fabric that smooths out your body. Thank you for reading lovelies! Hope you enjoyed this post. How would you describe your sense of style? Because I am super nosey, I really love reading about this post! LOL! Love your girly fashion, wish I was the same when I was younger, okay, make that wayyyy younger. I've always been a tomboy in my 20s and now that I am *ahem! * in my late 30s, I'm trying to add more feminine pieces and my husband is starting to believe I am having a mid life crisis. LOL! I LOVE the Mickey Mouse dress! I must buy it ^-^ The necklace is gorgeous too. You have gorgeous style! 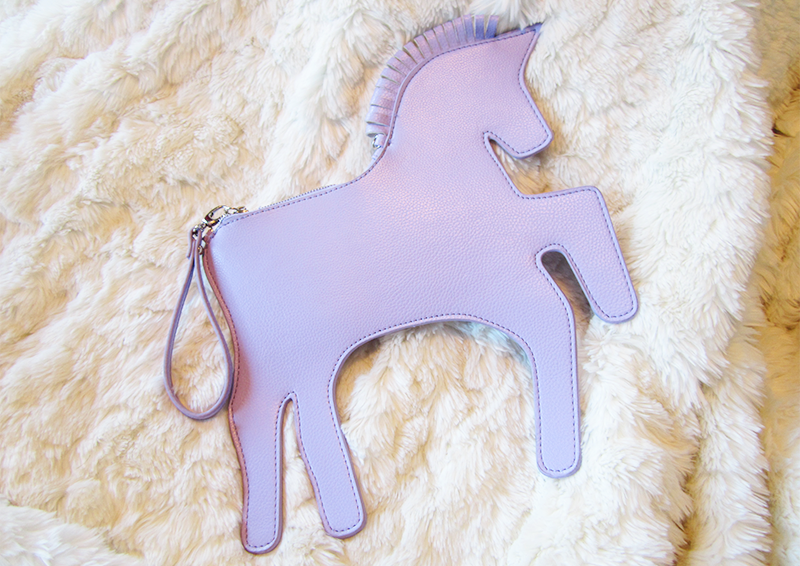 I need the unicorn clutch in my life, it's so cute! Aww no that's a shame! It's such a lovely dress! That dress matches your blog-signature, that's cool haha. 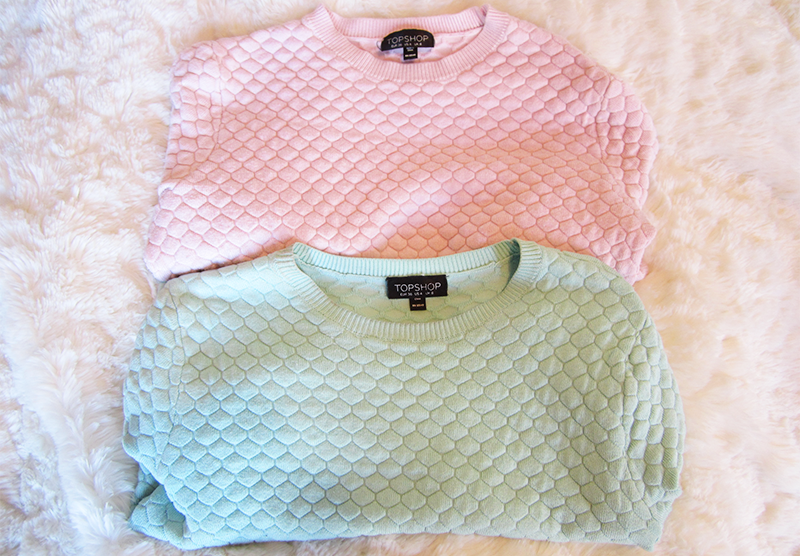 And oh those sweaters from Top Shop are lovely, especially the mint. I could think of quite a few things to pair that with. 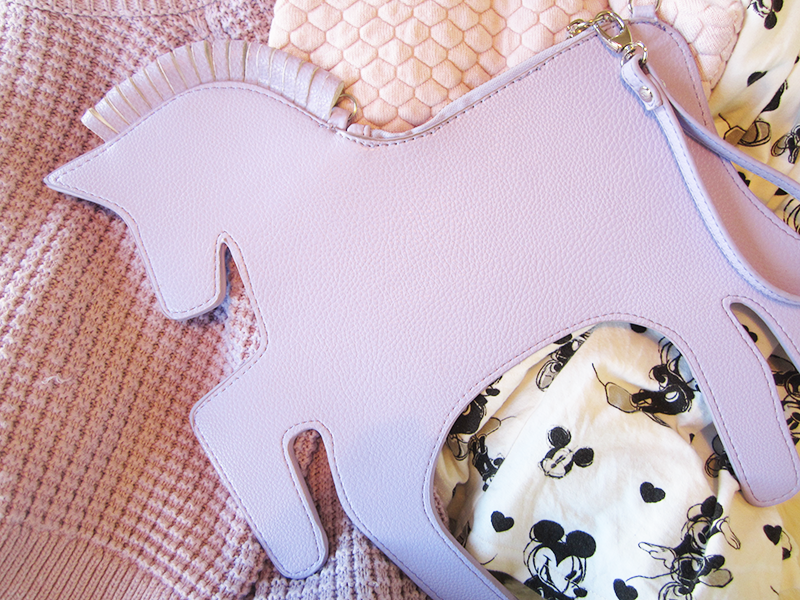 These are all so cute specially the unicorn clutch! I love that pastel colour! Mickey mouse dress, wish I can find a similar dress! don't be afraid to do OOTD! you have great items!